On Thursday 5 June was the private view for the University of Southampton Special Collections current exhibition: ‘The Early Modern Image: Patronage, Kings and Peoples’. Upon visiting the exhibition visitors are greeted with an arrangement of composition drawings on the level 4 gallery, for a set of tapestries of ‘Love and Folly’. 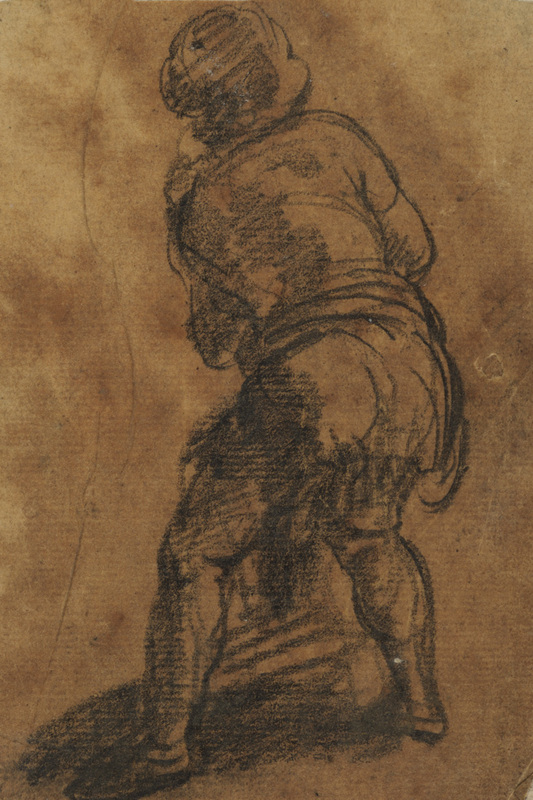 Such drawings showcase ‘Folly putting out Cupid’s eyes’ and ‘Folly guiding Cupid to the Garden of Love’. In contrast, the other side of the level 4 gallery displays figure and drapery studies from the album of tapestry designer Francis Cleyn, which feature coloured and tinted drawings focusing on different parts of the human body, and on different species such as fish. As I entered the exhibition gallery, I had already heard comments relating to the intricate detail of tapestry fragments and drawings, enticing me in further. The first object that greets the visitor is the album of Cleyn. Displaying two figures from a tapestry design, the album presents potential links to the Bible: the drawing of an old crone is suggested by art historian Professor David Howarth to be a study for the figure of Falsehood seen on the tapestry St Paul Preaching in Athens. As well as featuring prints and drawings, tapestry fragments are also displayed so that visitors can see the designs of Cleyn in their final form. Such fragments include parts of the reproduction of the finished Perseus and Andromeda tapestry from Ovid’s Metamorphoses. This fragment has been kindly loaned from the Victoria Albert Museum. Other drawings relating to classical literature include a grey wash brush drawing of ‘The Council of the Gods’, which is from Virgil’s Aeneid, Book 10. 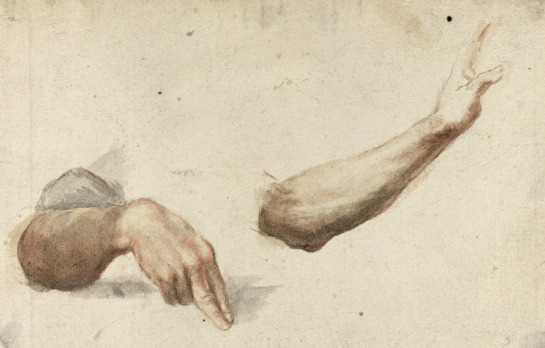 Another part of the exhibition focuses on the works of Luca Cambiaso, which are mostly of a religious theme. An example includes a drawing depicting four evangelists each reading his gospel. To complete the exhibition, a series of engravings and rare books are displayed. As well as depicting biblical images, such as the Holy Spirit descending as a dove to the Virgin Mary, other images take on a warfare theme. One example is the engraving by Giovanni Jacopo Caraglion titled ‘Battle scene with a shield on a lance’. Possibly dating from around 1537, the item catalogue suggests that the engraving may have been a rejected idea for Raphael’s Battle for the Milvian Bridge. The rare books largely include works by Dante Alighieri, which again take on a religious theme. Intricate illustrations are displayed on the pages, depicting the Garden of Eden and the Tree of Knowledge, and Dante being guided through Hell by Virgil. My favourite item was the image displayed by the rarebook Comento di Christophoro Landino fiorentino sopra la Comedia di Dante Alighieri poeta fiorentino by Dante Alighieri. The image depicts souls being drawn out of Purgatory on carts pulled by griffins. The exhibition is on display Monday-Friday 10am to 4pm until Friday 27th July, on level 4 of the Hartley Library. On 13 June 1917, London received its first daylight raid by the German planes called Gothas, a biplane with a wingspan the length of two buses. Although the 18 Gothas were opposed by 90 British fighters, none were brought down, leading to the death of 162 people. This figure included 18 children killed as a result of a bomb landing directly on Upper North Street School in Chelsea. These devastation of the raids led to schools in the city tightening up their procedures during bombings, to strengthen the protection of their pupils. The Russian troops besieged the fortified town of Silistria from March1854. Despite various assaults, as Edward Wellesley notes below, the Turks managed to hold well into June. The Russian forces eventually withdrew on 24 June after orders for the attack were revoked. The Battle of Waterloo resulted in a decisive allied victory. It not only ended the political and military career of Napoleon Bonaparte but also ended the series of wars which had raged across Europe, and other regions of the world, since the French Revolutionary wars of the 1790s. The decisive victory, however, came with a heavy loss of life on both sides. In the passage below, Wellington laments the cost of victory as he informs George Hamilton Gordon, fourth Earl of Aberdeen, of the death of his brother. On the 22 June 1941, operation Barbarossa was put into practice and German troops invaded Russia in three parallel offensives: nineteen panzer divisions, 3,000 tanks, 2,500 aircraft, and 7,000 artillery pieces poured across a thousand-mile front. This invasion occurred despite the fact that Germany and Russia had signed a pact in 1939, each promising the other a specific region of influence without interference from the other. Hitler ignored the warnings from his advisors that Germany could not sustain a war on two fronts. He believed that England was holding out against German assaults, refusing to surrender, because it had struck a secret deal with Russia. 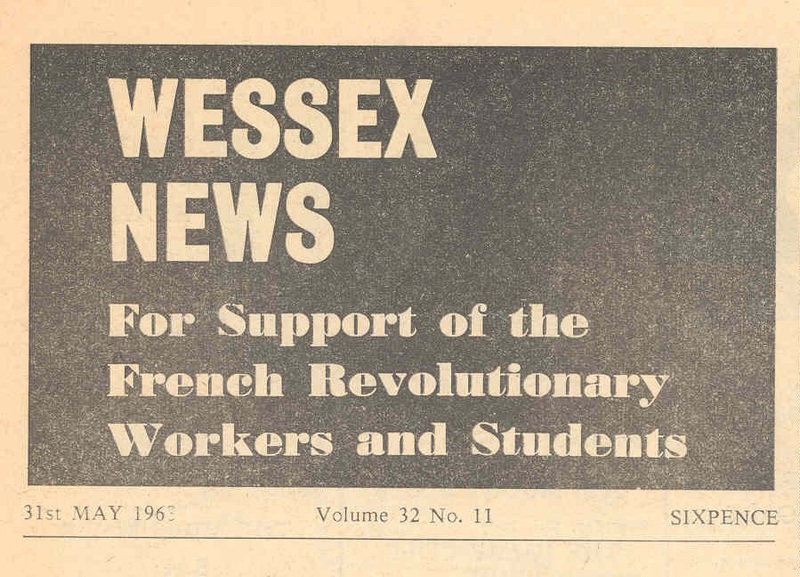 The Wessex News (now known as the Wessex Scene) is the oldest student news provider at the University of Southampton. Published by the Southampton University Students’ Council, now the Students’ Union, it has been in print since 1936. The editions held by Special Collections form part of the University Collection and date from 25 February 1936 to 16 May 1994. The collection provides student perspectives on life at the University as well as insights into significant developments and events in the University’s history. Danielle Eddington, a history undergraduate, provided us with a brief rundown of her experience using the collection while working on her final year dissertation. “As a history undergraduate, I encountered the archives during the dissertation introductory session. I got to look at a range of documents that were from my specialist period, the 1970s. I had been set on studying press freedom in Britain, but with so many sources at my fingertips, I was no longer sure! As Chief Rabbi of the United Hebrew Congregations of the British Empire during World War One, Joseph Herman Hertz was responsible for the Jewish communities residing in Britain and its colonies. The quote below reflects his efforts in ensuring Jewish soldiers were given religious support. His correspondent, Sir Charles Solomon Henry, first Baronet, Member of Parliament for the Wellington division of Shropshire, was instrumental in the formation of a synagogue at Southend and in the organisation of the Soup Kitchen for the Jewish Poor. Throughout history looting has been a common consequence of war. To ensure discipline among his troops Wellington applied severe punishment to any soldiers caught thieving or looting. However, bringing those responsible to justice was not always an easy task as is noted by the General Sir Robert H.Kennedy, the Commissariat General in the Iberian peninsula, in the passage below. The major stages in the battle of Normandy occurred between 6 and 9 June 1944, when significant progress in forcing a point of entry into France was made. The USA join the British and allied forces for a combined attack with the ultimate aim of driving Germany back. The significant advances made during this offensive resulted in the production of a historical issue of The Times. Key events over the course of the Second World War often resulted in the release of special issues of the paper and Samuel Rich notes the likelihood of the 6 June 1944 issue when the Normandy landings began, being reproduced on the 100 year anniversary of the battle.